What conditions does Razadyne treat? Tell your doctor right away if you have any serious side effects, including: fainting, unusually slow heartbeat, difficult urination. Get medical help right away if you have any very serious side effects, including: seizures, black/bloody stools, vomit that looks bloody or like coffee grounds, severe stomach/abdominal pain, irregular heartbeat. List Razadyne side effects by likelihood and severity. This medication should not be used if you have certain medical conditions. Before using this medicine, consult your doctor or pharmacist if you have: severe liver disease, severe kidney disease. Before using this medication, tell your doctor or pharmacist your medical history, especially of: liver problems, kidney problems, stomach/intestinal problems (e.g., ulcers, bleeding), heart problems (e.g., sick sinus syndrome, bradycardia, AV block, arrhythmias), breathing/lung problems (e.g., severe asthma, COPD-chronic obstructive pulmonary disease), seizures, problems urinating (e.g., due to enlarged prostate). What should I know regarding pregnancy, nursing and administering Razadyne to children or the elderly? Before using this medication, tell your doctor or pharmacist of all prescription and nonprescription/herbal products you may use, especially of: anticholinergic drugs (e.g., atropine, diphenhydramine, scopolamine, tolterodine), aspirin (high doses used for arthritis), cholinergic drugs (e.g., bethanechol), cholinesterase inhibitors (e.g., neostigmine), long-term use of nonsteroidal anti-inflammatory drugs (NSAIDs such as ibuprofen, naproxen), drugs affecting liver enzymes that remove galantamine from your body (such as azole antifungals including ketoconazole, amitriptyline, SSRI antidepressants including paroxetine, quinidine). Also report the use of heart drugs (those that decrease heart rate or block AV impulse conduction) such as: beta-blockers (e.g., metoprolol, propranolol), digoxin. Does Razadyne interact with other medications? 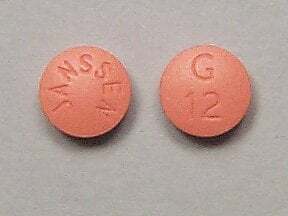 This medicine is a pink, round, film-coated, tablet imprinted with "JANSSEN" and "G8". 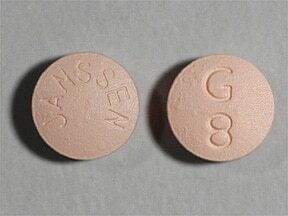 This medicine is a orange-brown, round, film-coated, tablet imprinted with "JANSSEN" and "G 12". 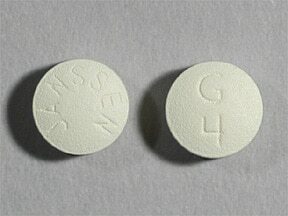 This medicine is a off-white, round, film-coated, tablet imprinted with "JANSSEN" and "G 4". Are you considering switching to Razadyne? How long have you been taking Razadyne?